The last time we chatted, it was still 2011. Now it’s March already! Holy Cow!! 2012 is moo-ving right along. (Sorry – couldn’t resist). Hubby and I spent a few days of R&R skiing at Mont Ste. Anne in Quebec City. 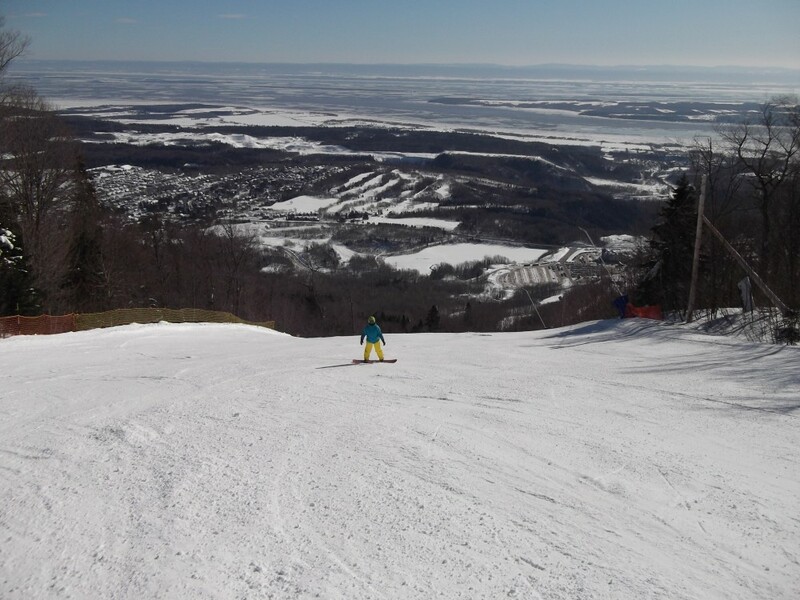 On some of the runs, it l ooks like you’re going to ski right into the St. Lawrence river. I am very colorful with my turquoise jacket and my bright yellow boarding pants. I’m really hard to miss, and when I tumble down the hill, it’s a lovely shade of teal as the yellow and turquoise combine. I try not to do that very often – the older I get, the less I bounce back. The snow conditions were ideal, and it was exhilarating to carve through the snow while enjoying the fabulous vistas. We have had an unusually warm winter, with next to no snow, and our ski season is already over (more than 3 weeks earlier than last year). Conversely, the west coast has had a much colder winter than usual. So say my west-coast quilting “buds”. 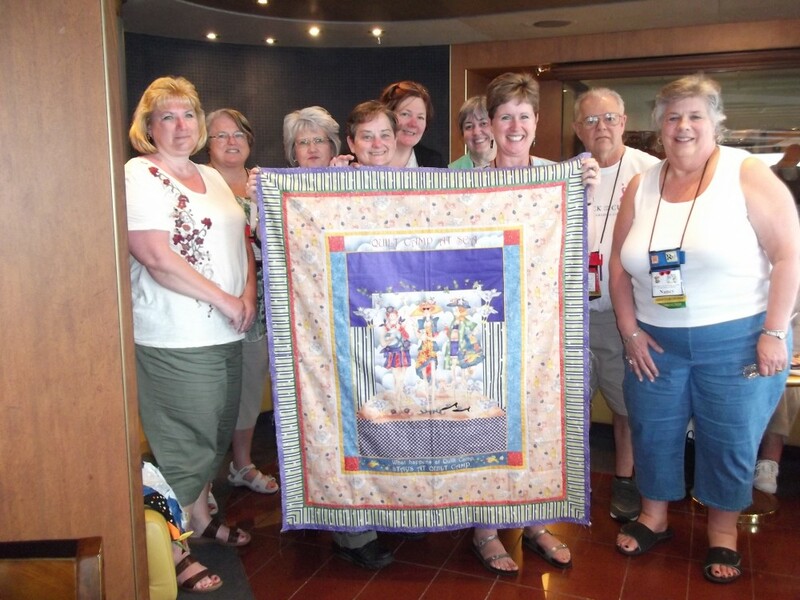 Last week I was cruising with the Quilt Camp at Sea gang on a Mexican Riviera cruise. 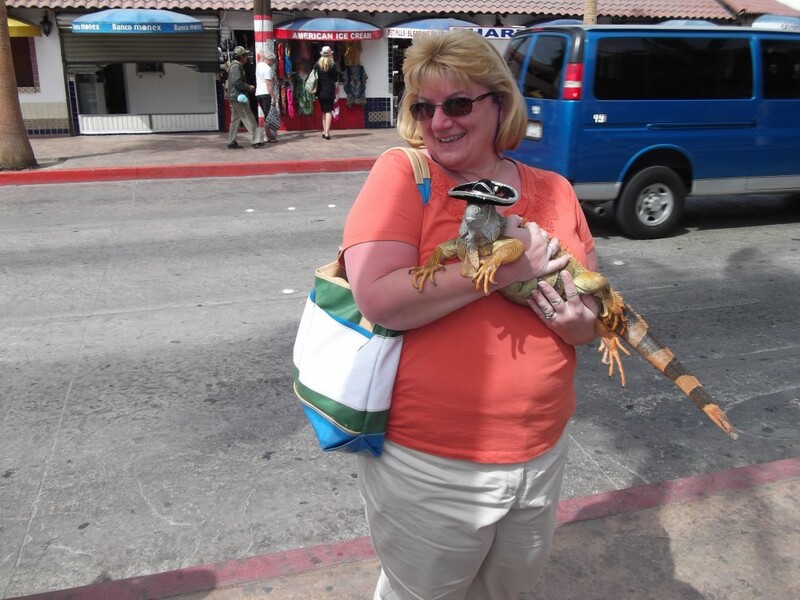 We all enjoyed the beautiful sunshine in Puerto Vallarta and Cabos San Lucas when we weren’t taking part in quilting classes and seminars. Our cruise left out of San Diego, and I was hoping to take part in the pre-cruise shop hop arranged by the San Diego area quilt shops, but alas, Delta Airlines had other plans for me. My students did a wonderful job in the 2 classes that I taught on the cruise. Cabin-mate Dixie, Beth and Karen took my double wedding ring class and discovered that curves are not that intimidating after all! At the show-n-tell during our Farewell party, Beth held up her sample, made with the Stonehenge Maui fabrics, because the second part of the cruise is 2 weeks in Hawaii. I had eight students in my mystery class, and they did an amazing job of getting their class projects almost completely done. In the process, they learned several different border techniques, including working with stripes in borders and getting them to match in the corners. Several students, including JoAnne, managed to get all but the final border on their quilts. Woo-hoo! 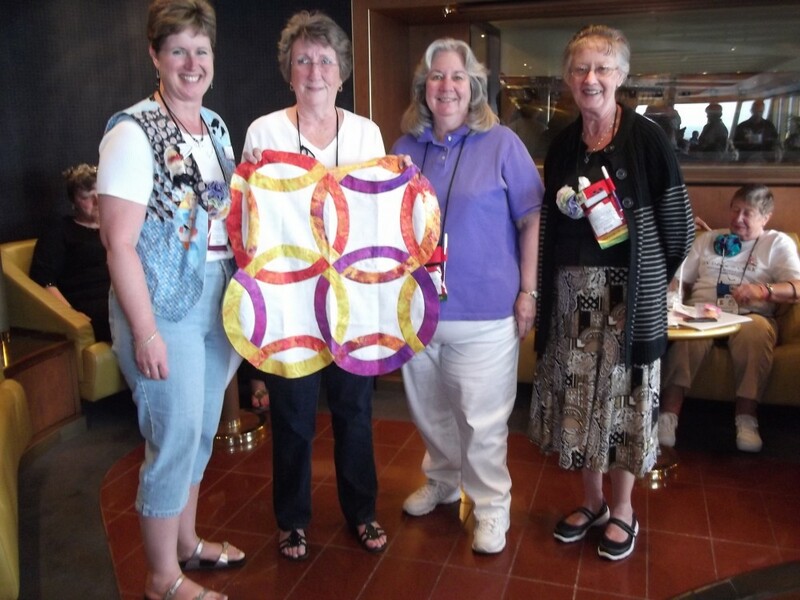 Quilt Camp at Sea coordinator Pat Tobin and her staff did an outstanding job keeping everything running smoothly. Pat is passing the torch on to fellow staffer Kathy Domkoski, who is organizing the 2013 Alaska cruise June 22-29 and also a Fall 2013 New England/Canada cruise. Visit www.quiltcampatsea.com for details. Karen, Susan, Carol, JoAnne, Pat, Barbara, Charles & Nancy with me in my mystery class. On the last Alaskan cruise, I purchased a delicious bundle of fat quarters from on-board quilt shop The Needle and I. Over the Christmas holiday, I managed to use it for a duvet cover for my silk duvet purchased in China last November. I love how it looks like stained glass! Now all I need is some matching pillow shams. Since I used something up from my stash, I can confidently purchase something else – isn’t that how it works? I want to send a shout-out to follower Shirley Jobson, a finalist in the McCall’s Quilting “Quilt Design Star” 2011 contest. Congrats, Shirley! Shirley hails from Elk Lake, Ontario, where she was my able-bodied helper at the Elk Lake retreats. She is also known as Petunia Pinner and Jackie the Ripper. Imagine my excitement when I was flipping through the March/April issue of McCall’s Quilting recently, turned the page and saw my Freckles Frenzy quilt staring back at me in all its glorious color. I gasped!! Ohmygosh! 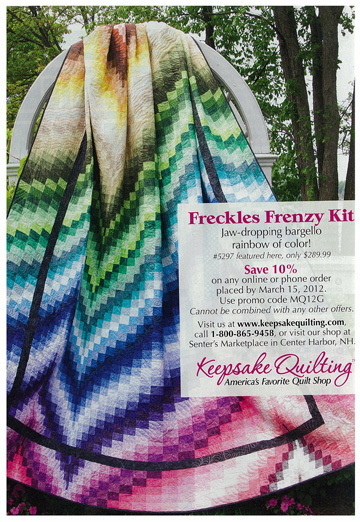 Thanks to Keepsake Quilting for featuring it in their full-page ad. (They are selling kits for the queen-size version.) The quilt uses all 91 colors of Freckles, and is simply a rainbow of color. 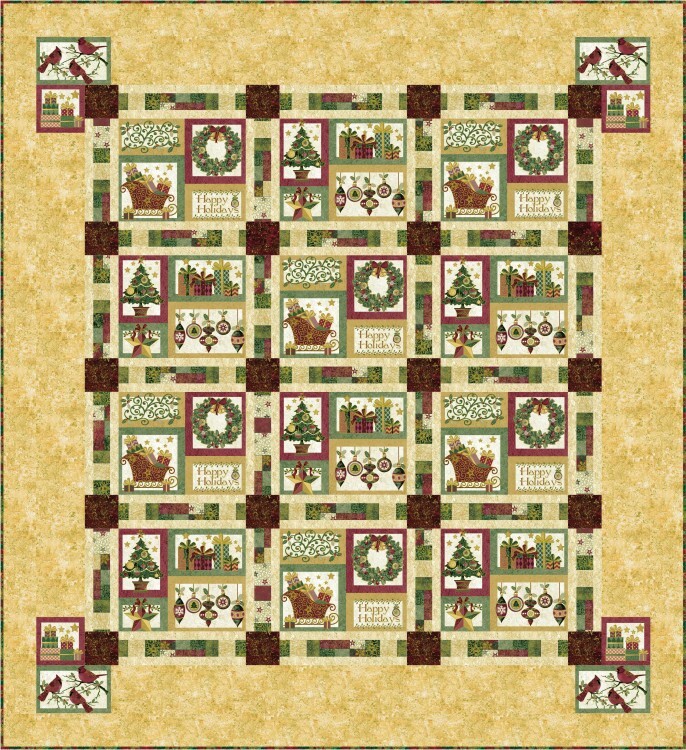 Quilter’s Newsletter magazine is working on their Best Christmas Quilts issue, coming out in August. I played with Northcott’s new Stonehenge Christmas Traditions and came up with a super easy quilt that uses the panel and just a couple other fabrics. The editors selected my design to be included! Needless to say, I was delighted. I try to use interesting fabrics such as panels in new and different ways, and I think this quilt is a good example of this. 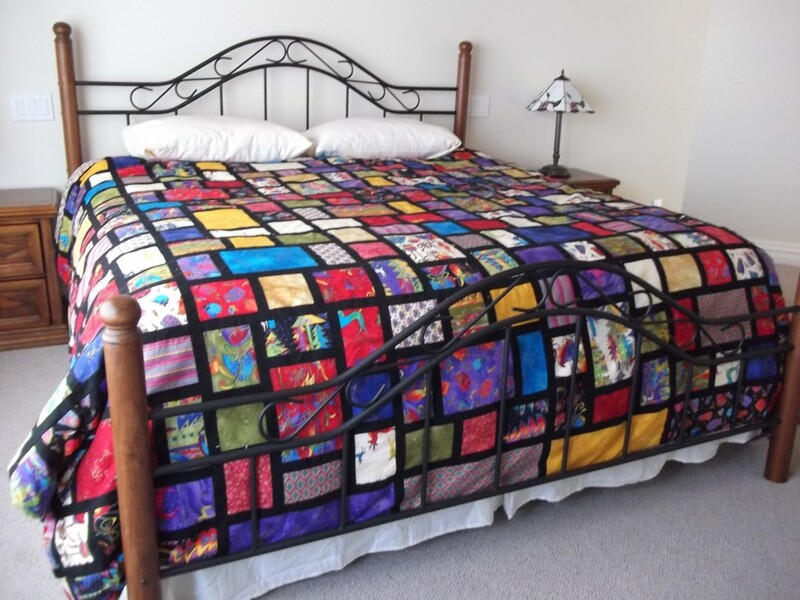 Susanne had this queen-size quilt top put together in less than 2 days. Well, that’s it for now. Susanne and I are finishing up a couple more quilts, and I will have pictures for you shortly.